Explaining what is funny about a work of comedy, especially live comedy, often feels like justifying the pleasantness of a song’s melody. The notes are in a satisfying order; the rhythm is… also satisfying; the harmonies are harmonic? It’s an exercise in tautology that usually amounts to saying a thing did the job it exists to do, which is… to be expected. With comedy, at least, we can turn to matters of language and plot: “Famous Comic effectively equated Mundane Thing to Very Serious Thing!” “Witty Sketch effectively imagined what things would be like if they were a different way than they are!” “Improv Group did a Funny Bit, then Several Escalating Versions Of That Bit!” But this too is insufficient; while certain formulas make for good comedy, good comedy is more than the formula that made it. To paraphrase Will Eno, twelve is two times six, yet “two times six” does nothing to help us comprehend the infinitude of numbers contained within twelve. Similarly, the all-too-common conflation of good comedy with successful comedy—comedy that meets the minimum requirements of Funny—risks diminishing or ignoring the qualities that make for truly transcendent work. Sadie Hawkins Day: Love Knows No Bounds is such a work. 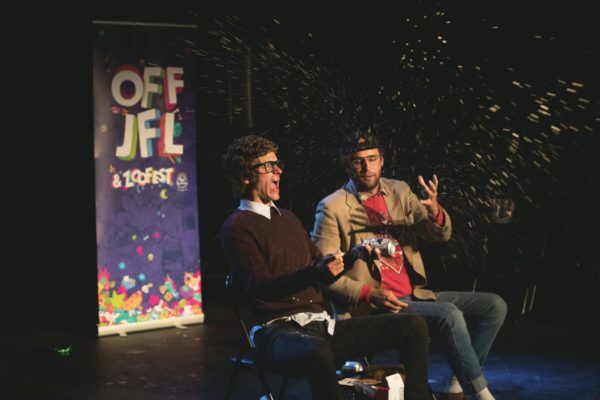 Now running at the Upright Citizens Brigade Theatre in Chelsea, it is a transcendently, violently funny play that dances effortlessly between the languages of sketch and drama, performed with nimble grace by Matt Barats and John Reynolds. These two, also the play’s writers, can be seen more often at the Annoyance Theatre—the Chicago improv and sketch theatre that opened a Williamsburg location last year—and bring a Chicago aesthetic with them to the UCB stage. It’s a refreshing addition. The UCB has made immense contributions to American comedy, but it has also become the very sort of monolithic institution in whose defiance it was created. The framework it teaches comedy writers—chiefly, the tenets of game in sketch and improv—has become so culturally saturated as to be a crutch in all but the ablest hands (for instance, those of Sadie Hawkins Day director Langan Kingsley, a UCB standout). Have you ever marveled at the ease with which you predicted the trajectory of a joke or a sketch? Have you ever done this again and again and again? Ten bucks says it’s because you’ve seen enough comedy that you have a gut understanding of how things work. To be sure, predictable work can still be very good work, and the notion of “game” is plastic enough to shirk most every possible critique. Still, a genre that thrives on surprise will inevitably collapse under the weight of its conventions. The Chicago philosophy is looser, elevating interrogation of character over plot structure—a hierarchy well-enacted in Sadie Hawkins Day. Written through improv, it has a simple story that sounds, well, kinda dumb. It’s the evening of the big Sadie Hawkins Day dance, when the girls ask out the guys. Mr. Box (Reynolds), a high school earth sciences teacher in love with his student, Bryson (Barats), goes to Bryson’s house to confess this love. Bryson, fretting over his date with the most beautiful girl in the school—Ramonica—has other things to worry about. Mr. Box then drives Bryson to the dance, gives the boy his SUV, and walks into the town lake. Save for a few surreal interludes, the play basically encompasses three conversations, one of which takes a brief detour into controlled chaos as a group of locals (Carmen Christopher, Gary Richardson, Ana Fabrega, and Wes Haney) climb into the car and shotgun a considerable number of beers. Its single act moves briskly but attentively: every detail mentioned is examined, every emotional payoff is well-earned. One of my favorite running jokes involves Bryson’s ability to turn into “Teen Lizard,” a power that made him MVP of the school basketball team. This plays like a silly throwaway on first mention—his coach and teammates are upset Bryson’s decided to start playing “full human”—but it gains surprising emotional resonance as the story progresses. Impressively, Sadie Hawkins Day is not just well-written comedy but a well-written drama, too. How, then, to quantify transcendence? I suppose the main thing Sadie Hawkins Day has going for it is genre parody. It deftly inverts ‘80s feel-good teen movie tropes, asking us (successfully, I think) to care about the teacher who wants to date his student. Reynolds, whom you may recognize as a deputy in the Netflix series Stranger Things, somehow finds stoner-bro territory yet uncharted by the likes of Seth Rogen and Jonah Hill. Box is very, very stupid, but Reynolds plays him with complete sincerity, a deadpan I daresay is unparalleled in New York City. It helps that he has a wickedly precise imagination. In the first scene, Box emotionally unburdens himself on a drive-through attendant, lamenting that things aren’t going well at home and he’s been sleeping in the treehouse, which is also occupied by a colony of bats. True to the “if this, then what?” spirit of improv, images like this are never left to support their own weight: with resignation, Box goes on to explain how he pretty much has to carry around a bag of grapes to keep the bats from attacking his, er, more sensitive parts. Later, he gives Bryson the tired refrain that when he was younger, people his age cared more about romance. Now kids are so horny that he just saw one of his students eating a box of ejaculate for lunch, with a fork and knife (“It took him two hours!”). It’s of course impossible to convey the impact of these jokes out of context, but what’s important is that they are not punchlines. They are the texture of the play. As with any artifice, the problem with game in comedy is that it imposes certain expectations of what will be funny and when—expectations of what’s to come that hover over the viewer’s experience of what’s happening now. In the absence of familiar structures, a work is free to find its own peculiar rhythms, to deliver payoffs where payoffs do not usually belong. Suddenly the tiniest moments—the precision of a bag of grapes warding off bats—can be immensely pleasurable. In capable hands, these pleasures might come in virtually unbroken succession. Probably the most compelling reason to adopt an artifice is to subvert that artifice, be it a sketch or an observational standup routine or a well-made play. What’s most delightful about Sadie Hawkins Day is the conviction, not to mention the sheer organic ease with which it tells a full, textured story about a teacher in love with his student. Though the play is obviously poking fun at a certain type of story, it never does so with the haughtiness or self-satisfaction of so much satire. It’s just—a good time. And if I’ve spoken less about Barats than Reynolds here, it’s only because Bryson is pretty much the straight man to Box, though the character is no less entertaining. Barats is a limber, doe-eyed performer, a perfect complement to Reynolds’ stiff, squinting Box. Each has enough presence to command the stage on his own; together they are something else entirely. I firmly believe one of the most enjoyable things one can do is watch other people who are very good at a thing have a blast doing that thing. Often this is music; sometimes it’s improv. Very rarely is it a play like Sadie Hawkins Day.